Mahindra XUV300 W6 Diesel is the mid diesel variant in the XUV300 lineup and is priced at Rs. 9.30 lakh (ex-showroom, Delhi). This base variant comes with an engine putting out 115bhp@3750rpm and 300Nm@1500-2500rpm of max power and max torque respectively. The gasoline motor comes mated to 6 Speed Manual transmission which is quite a joy to use. Mahindra claims an average of 20 kmpl for this mid W6 Diesel variant. Share your experiences with XUV 300? Q. What is the difference is W4 and W8 petrol model? Q. What is the major difference between W4 and W6 petrol? Q. What all specs and features are available in XUV300 base model petrol? Also is the sunroof available for all models in XUV300? The brand hasn't disclosed its whole feature list as per the variants yet. so, we would suggest you to wait till its lauch. Q. Please send the features of XV W4 variant. 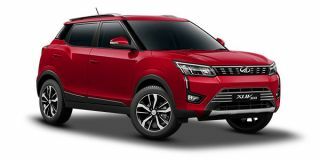 The Mahindra XUV 300 W4 variant has some of the high-end features like 17" alloy wheels, dual airbags, smart steering system, led tail lamp, electric tailgate release, electric adjustable OREM etc. Mahindra of late has pleasantly surprised us in the last couple of comparisons we’ve run, first with the Marazzo and then with the Alturas G4. This time around we have the petrol-powered XUV300 pitched against its nearest rivals. Can the Mahindra manage to better Ford’s EcoSport and Tata’s Nexon in this round?